1. Shred the cavolo nero leaves as finely as possible and set aside. Put the oil in a medium saucepan, then set over a low-medium heat. Add the onion with a little salt; cook gently for 7 minutes, stirring, until soft and translucent. Add the garlic and cook for 1 minute, then stir in the spelt. Turn the heat up slightly and add the wine, stirring until it has almost evaporated. Add the stock and cover. Simmer gently for 25-30 minutes, stirring now and then. The spelt should be tender but not mushy, and a little liquid should remain. 2. 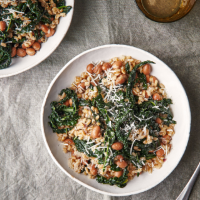 Uncover the pan, add the cavolo nero and borlotti beans and cook, stirring, for 5 minutes. Remove from the heat; add 2 tbsp grated cheese and the butter. Cover and set aside for 2 minutes. Season, add the lemon juice, stir well and divide between warm serving bowls. Serve scattered with the remaining cheese. This recipe was first published in Thu Sep 27 14:29:33 BST 2018.